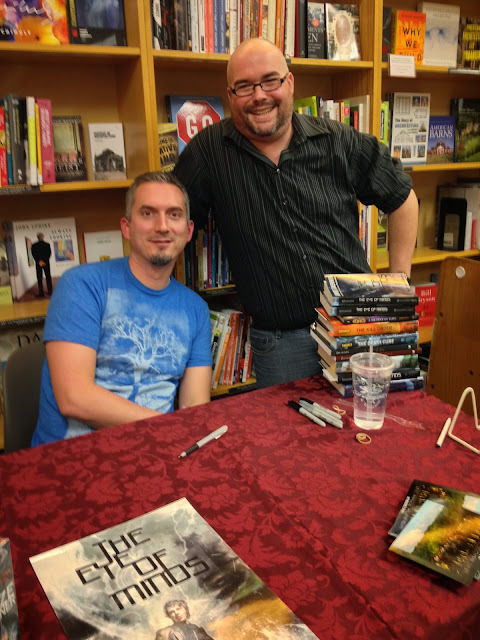 that right there is me with James Dashner, author of The 13th Reality and Maze Runner series. James is on tour promoting his new book, The Eye of Minds, the first book in his Mortality Doctrine series. I've actually known James for several years now. I received an ARC of the first book in The 13th Reality series, The Journal of Curious Letters way back when and we started chatting on LibraryThing then. When the first book in The Maze Runner series was released, James came in for a quick signing at Borders in Ann Arbor, so I drove over for that and finally got to meet him in person. When Whitney told me that she had booked him for The Eye of Minds, I was excited to get to see him again. James is a great guy. He's a fun speaker, and really appreciates his audience and really likes to interact with them. If you ever get a chance to see him, go. You'll have a good time. Now, that big stack of books in front of me in the pic up there? Those are all the books that I took to get signed in addition to picking up The Eye of Minds. What's up with the two copies on top of that stack of books, you ask? (And if you didn't ask that, you should.) Well, I also had two copies of the ARC of The Eye of Minds that I asked James to sign so I could give those away on here! All you need to do to enter is sign up using the Rafflecopter below and that's it! Good luck to the winners and happy reading! The first thing I thought when I saw your pic was "OH HAEL NO! ".